Dymonic FC is a high performance, low modulus, one-component, moisture curing, polyurethane sealant. Dymonic FC is a durable, flexible polyurethane sealant that offers excellent performance in moving joints. Dymonic FC does not require a primer on most construction materials, and exhibits tenacious adhesion once fully cured. Expansion and control joints, precast concrete panel joints, perimeter caulking [windows, door, panels], EIFS, aluminum, masonry & vinyl siding. Do not apply over damp or contaminated surfaces. Meets U.S. Federal Specification TTS-00230C, Class A, Type II; Canadian Standard CAN/CGSB-19.13-M87; and ASTM C920, Type S, Grade NS, Class 100/50, Use NT, M, A and O. AAMA 802.3 Type I and II, and AAMA 808.3. Dymonic FC Sealant is used to reinforce and seal the mounting of a solar pool heater. 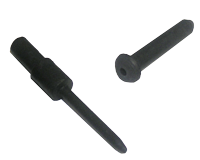 It is used under the Strap and Header Clips, and on the Screw Heads for shingle applications. Refer to the Vortex Install Manual for details on using this sealant during a solar pool heater installation. May be used in any vertical or horizontal joint design in accordance with accepted architectural/engineering practice. Joint width should be 4 times anticipated movement, but not less than 1/4 inch [6.4mm] wide. For joints 1/4 inch [6.4mm] to 1/2 inch [12.7mm] wide, the width to depth ratio should be equal. Joints 1/2 inch [12.7mm] wide or greater should have a sealant depth of 1/2 inch [12.7mm]. Minimum joint size is 1/4 inch by 1/4 inch [6.4mm by 6.4mm]. For good adhesion, the joint interface must be sound, clean and dry. Depending on the substrate, or presence of form release agents, masonry waterproofing, dust, loose mortar or laitance, architectural paints or finishes, the joint surface may require a thorough wire brushing, grinding, sandblasting, solvent washing and/or primer. Tooling is recommended immediately after application to insure firm, intimate contact with the joint interface. Dry tooling is preferred, although tooling agents can be utilized. Excess sealant and smears adjacent to the joint can be removed with Xylol or Toluol before sealant cures. Closed cell polyethylene backer rods are preferred as joint backing to control depth of sealant bead. Where depth of joint will prevent use of joint backing, an adhesive backed polyethylene tape should be installed to prevent three-sided adhesion. Cartridges of Dymonic FC are easy to apply with conventional caulking equipment. Fill joint completely with a proper width-to-depth ratio and tool. Damaged sealant can be repaired. Consult your Tremco Distributor or Representative for repair procedures. Tack Free 72 Hrs. Max. The sealant joint is no better than the surface to which it is attached. All of the rules for joint preparation come down to a few words...it must be dry and clean. Concrete surfaces must be fully cured, clean and dry; curing aids and form release agents removed, if necessary, by sandblasting or grinding. Loose dust must be thoroughly brushed off. If curing or form release agents have been used, run test to determine their effect on adhesion of sealant. Concrete surfaces are often wet, either from retained water or rain. Surface may appear dry and still contain too much moisture for a good bond. If this is the case, flame drying may be called for, or washing with water miscible solvents such as methyl ethyl ketone [MEK]. A discussion of this problem will be found below in the section on handling of wet concrete joint. • Glass, Porcelain, Tile, etc. Excellent seals can be made to glass and other surfaces. Absolute cleanliness is needed. Surfaces must be cleaned by a material such as methyl ethyl ketone, dried well, and then sealed. Protection from oil and fingerprints is important. Solvents used must be clean and free of oil. Tremco Sealants will adhere well to new, dry wood. If surface has been painted, it must be cleaned. Woods such as teak contain oil which dries out very slowly. This type of wood may require use of primer. If wood is oil bearing, bond may develop slowly. Bond to painted wood is of no more value than the bond of the paint to the wood. Sealants will adhere to paint, but if possible, paint should be scraped away to expose the wood. Seals can be made to steel, stainless steel, aluminum, brass or bronze, and most other metals. The surface should be wire brushed and solvent cleaned. Protective varnishes should be removed unless they are very firmly adhered. Baked finishes are usually as good as clean metal, but must be oil and wax free. Oxide films such as old aluminum, and some types of “rusted finish” steel, present some problems. Surfaces should be freed of all loose particles and cleaned as well as possible before priming. Grinding is preferred, if possible. Solvents such as paint thinner will remove grease and oil, but care must be taken to prevent redeposition form the solvent. It should be clean [not reused] and applied liberally and wiped off with a clean rag. The rough, clean surface from wire brushing is very good for adhesion. It should be solvent wiped but not polished. Extreme care must be taken to expose clean metal on a metal-to-metal wall joint. These surfaces are usually dirty and since they are not directly exposed, a simple brushing is not enough. A cleaning tool which can apply some force should be used. Since many joints are deeper than 1/2” [12.7 mm], [maximum usable depth for a sealant, usually 1/4” [6.4 mm] is all that is necessary], a backing or filler is needed to control sealant depth. a. Fill opening from bottom up or out; entrapped air is not a sealant. b. Use some force to help the sealant wet the surface. Sealed joint should not bulge out from excess material, but be slightly concave. Non-sag or standard type sealant will do a very poor job of “wetting” to a rough surface such as concrete unless some force is applied. Even under the best application conditions, the area of contact to concrete is probably less than 50%. Tooling will not be as effective on concrete as initial pressure since tooling cannot eliminate small surface bubbles. Vertical joints must be backed to the proper depth and the sealant forced against the sides by same techniques as described above. Freehand filling of unbacked vertical joints will lead to serious problems. Since Tremco Sealants are cured by moisture and the reaction of water or moisture vapor with this type of material is rather complex, a detailed consideration of joints in wet concrete is necessary, with the understanding, Tremco does not recommend applying sealants to wet surfaces. The reaction of moisture with the active component of the uncured sealant can result in formation of the desired polymer by a reaction which leads to the simultaneous development of CO2 with the consequent formation of swelled and unsightly joints. This “blowing” reaction takes place at temperatures of 90°F [32°C] and above and is greatly dependent on the amount of water and sealant present. If large joints in wet porous concrete must be prepared, care must be taken to minimize these bubbles which cause an unsightly swelling of the joint. The quality of the polymer does not depend upon a gas-free cure. Sealants cure primarily from the top down or from the outside in. Gas formation is greatly reduced if thickness of sealant is kept below 1/4”: [6.4 mm]. If sealant layer is 1/4” [6.4 mm] or less, much of the gas is diffused to the atmosphere. If joints are prepared as described, a minimum of difficulty will be encountered. Joints made under adverse conditions should be properly backed up so that minimum thickness of sealant is exposed to the concrete surface. If the joint must have physical strength or penetration resistance, a firm backing material can be used with no reduction in joint quality. Various techniques for making laminated joints have been developed for the construction of watertight and level expansion seals in concrete. These must be considered in terms of the specific job to be done. If the concrete slab is partially sealed, either by a membrane below or a sealing coat on top, or both, special consideration must be given to the fact that an abnormal pressure of water may be developed in the sealed slab. Water on surface to be sealed prevents the liquid from forming proper bond and interferes with proper adhesion of the sealant. At temperatures near or below freezing, an invisible film of ice is usually found on exposed surfaces. It is impossible to form a bond under these conditions. When work must be done at temperatures below freezing, the most acceptable technique is flame drying of the joint and application of the material while temperature is still above 40°F [4°C]. This presents complications since a long run preparation is not possible. Heavy applications of water miscible solvent such as methyl ethyl ketone will assist in removal of ice and cold moisture. Of these solvents, methyl ethyl ketone is the only one acceptable in the case of Tremco Sealants. Successful cold weather installations have been carried out and, while difficult, winter caulking is not impossible. Horizontal joints using self-leveling materials are easily made by following precautions and vertical joints with non-sag materials can be successfully constructed if care is taken. Tremco Sealants will adhere to clean surfaces of similar material and damaged areas may be cut out and replaced. Primer is needed if new seal is to old sealant surface which has been cut clean. When resealing joints which have been sealed by use of hydrocarbonaceous sealers such as asphalt or pitch, it is essential that all of this material be removed and a clean surface be exposed and primed. 1) All surfaces must be clean. 2) If narrow joints are filled, the possible large percentage expansion must be considered. 3) Pressure against the surfaces is necessary. Opened cans will probably set up unless closed promptly after material is removed, and sealed tightly. The seals in Tremco Sealant cans and cartridges are the best available and will usually hold for long periods of time. The worst possible condition is cycling temperature which causes breathing action into any air space. Avoid exposure of the sealant at high temperatures. If five gallon or larger containers are used, they should be kept sealed by follower plates or other filling devices. The surface of a sealant joint may be tooled or smoothed in order to obtain a better appearance. This tooling also has a favorable effect on obtaining seating of the sealant against the walls of the cavity. In order to obtain as smooth a surface as possible, the finishing tool should be wet with solvent. Because of the nature of the Tremco Sealants, this solvent must not be alcohol, but toluene or xylene is highly successful. Taping sides of joint is recommended in any size where an extremely accurate match to the edge is desired. The tape can be removed without difficulty any time up to four hours after application of sealant. Local Tremco representatives are available to instruct the applicator in the use of Tremco Sealants. It is our policy to assist in the initial use of our sealants whenever possible, since the outstanding properties of urethane sealants are best achieved by a full understanding of proper application techniques. Most Tremco Sealants are “one-part” materials. These urethane materials cure by reaction with the moisture of the air. They cure fastest in hot, moist air, slowest in cold, dry air. Under normal conditions, 40%-70%RH, and 50°-80°F [10°-20°C], the exposed surface of sealants will “skin” overnight and will cure in 48-72 hours. After this length of time, cure is complete; but adhesion is only partially developed. The adhesion bond does not achieve its maximum strength for two to four weeks. Samples tested after several hundred hours of weatherometer exposure have better adhesion than the originals. The cure of one-part material is greatly affected by temperature and humidity. Under conditions of high temperature and high humidity, the cure may be extremely rapid. The most critical time is the second day, i.e; the time from 18-36 hours. If conditions are unfavorable, the cure will be too rapid after the skin has formed with resultant gas formation. If substrates are porous materials such as concrete or limestone, the excessive amount of moisture may accelerate curing still further with resultant swelling of the joints. The best solution to this is reduction in the amount of material present by use of a larger backing strip on top of the backing in horizontal joint. Tremco warrants its Sealants to be free of defects in materials, but makes no warranty as to appearance or color. Since methods of application and on-site conditions are beyond our control and can affect performance, Tremco makes no other warranty, expressed or implied, including warranties of MERCHANTABILITY and FITNESS FOR A PARTICULAR PURPOSE, with respect to Tremco Sealants. Tremco’s sole obligation shall be, at its option, to replace, or refund the purchase of the quantity of Tremco Sealant proven to be defective and Tremco shall not be liable for any loss or damage.